Children's theater director Patricia Rickard-Lauri is seen at a rehearsal, standing in the wings in the auditorium at Waterman Elementary School giving notes to costumed members of a cast. Children's theater director Patricia Rickard-Lauri takes to the boards as she and a cast member work through stage choreography at a rehearsal of "Snow White" in Skaneateles. Surrounded by Skaneateles-area children is theater director Patricia Rickard-Lauri, who is given a memento of appreciation from the cast members during a party after a performance. SKANEATELES | When Patricia Rickard-Lauri was little, she took her tap-dancing talent on the road. With a piano-playing neighbor and her singing daughter, the trio performed across the state. The siren call of the stage stayed with her. This year, Rickard-Lauri plans to exit the stage after a 50-year career as a director of children's theater. 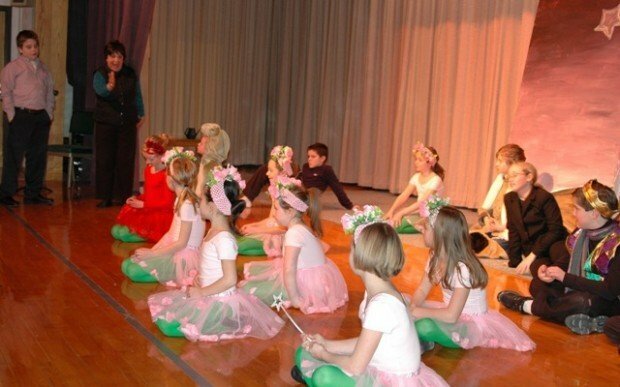 In Skaneateles, her Curtain Call program with the YMCA began in 2005. Program Director Sheila Card said the program grew each year, with the seasons culminating with final productions. "The program gives the kids a great sense of self and what it's like working together with other children," Card said. "They were really upset when Pat told them that this was going to be her last year." Child actors blossom on stage, Card said, in part because they are given latitude to design each show's sets, costumes and the script. "She's very passionate about theater and really wants the kids to get involved," Card said. Rickard-Lauri never forgot her own early adventures delighting audiences across the state. The first woman in her family to graduate from college, she studied physical education and dance at SUNY Cortland. One of the first jobs was teaching dance to students at the New York State School for the Deaf. She sat in on a colleague's class and observed how those who were deaf or hard of hearing could move to music. "I, at first, said no, I know nothing about deaf children," Rickard-Lauri said. "But I was fascinated at how proficient the kids were, so I took the challenge on." Little did she know that job would guide her toward a fulfilling career teaching theater skills to children with and without special needs and disabilities. 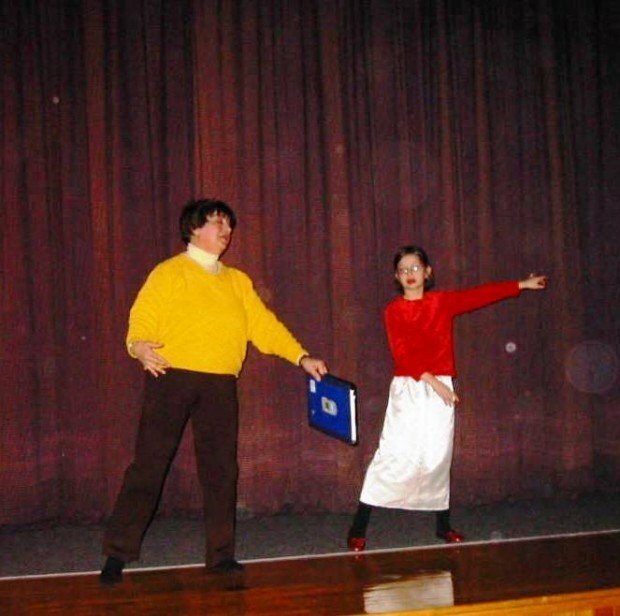 She went on to learn sign language and teach language skills through movement and theater with her students by producing a play or musical each semester. In 1975, she wrote her master's thesis, "There is No Significant Differences in the Rhythmic Ability of the Deaf and Hearing Child." "Through dance I was teaching English as a second language to the deaf kids," she said. Rickard-Lauri's work expanded to include all children in theatrical projects that bridged any auditory gap and brought everyone to the same table. "I thought, we need to bring these populations together, and not through education, but the arts," she said. She co-chaired the Central New York Very Special Arts Festival for years, became an arts consultant for the state education department, and began to work as an artist in residence bringing the arts-in-education to schools. In 2002, she founded the Khoros Performing Arts Company for Kids, a non-profit theater organization for children 6 and older, with and without special needs. The group is based in Old Forge during the summer, and Skaneateles during the school year. The fundamental job of an actor is to understand why stories are successful and to make choices that create compelling characters. Asking children to work toward these goals, Rickard-Lauri said, prompts them to succeed later as adults when job, family and life circumstances require them to find solutions to problems and think creatively. "Theater is a vehicle, and a good coach will teach this in sports as well," she said. Her directing style is inclusive, ensuring the final product is a group effort between the young actors and set and costume designers. They also edit scripts so lines of dialogue are as natural as possible, and help devise their own choreography and movement. "So the kids have ownership," she said, "and they can take pride in their accomplishments." This style is evident in her collaboration with composers Carol and Clive Robbins on the book "Snow White: A Guide to Child Centered Musical Theater." The guide incorporates the story of the Brothers Grimm fairy tale along with a script, lighting, costume and set design suggestions, plus a compact disc of original music written by the Robbins. The book is comprehensive and promotes a customized product by providing a framework for the young artists to create their own version of the story. She is also the author of 10 original plays and musicals. While she is stepping away from working as a theater director, she will continue to adapt international fairy tales and folklore for the stage. "Children need beauty in their life," she said. "And theater is so magical, and I tell the kids, 'You're part of that magic.'" Staff writer Carrie Chantler can be reached at 685-5701 or carrie.chantler@lee.net. Khoros is the Greek word for "play" and is the root of the word choreography.